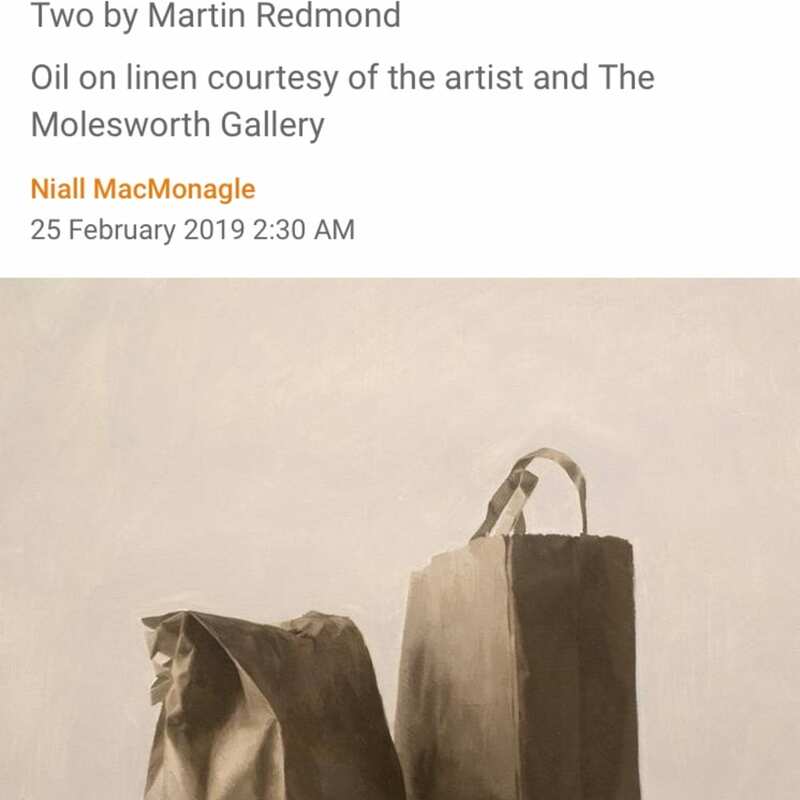 For Gorey-based artist Martin Redmond, it's in the bag. Plain brown paper ones, white paper bags, a TK Maxx-branded bag. Some are crumpled, others stand tall; some have serrated edges, some have delicate handles attached. And all are carefully sourced and chosen, placed and arranged and these fragile, throwaway objects are captured forever by Redmond in muted colours. "When I began painting bags I noticed that all I needed was a couple of earth colours and a couple of blues." Redmond always loved drawing. "My father was a sculptor, he encouraged me, taught me. I don't think there was any stage where I wasn't interested in making art of some kind." For his Graduate Show at Carlow IT, he was, he says "using a much broader palette. The paintings were of empty rooms and houses at night. Feeling-wise, maybe the work wasn't miles off what I'm doing now." In college it was oil on board or cotton canvas, but he now prefers linen for its "more uneven weave and feel". His extraordinary attention to detail, texture, light, composition resembles Giorgio Morandi and Carlo Bravo, though Redmond was unaware of both until "similarities were pointed out to me". Israel Hershberg and Antonio Lopez Garcia "probably influenced me the most". Redmond has boxes of bags, from fast-food takeaways, shops, somebody's kitchen, a recycling bin. In his small room with white walls, a north-facing window, "I set up objects to take photos". Late evening light is very relaxing, "I'll start when there's two or three hours of light left and then I usually work from two or three photographs. I'm a quiet person, I quite like being alone with my work, enjoy time alone in general." A bag is a bag is a bag but not when Redmond paints them. Could this painting be interpreted as one confident, one crushed, a male and female bag, a young and old bag? "I try to set it up so that it resonates with me emotionally and/or has an anthropomorphic feel to it..." Redmond also paints pillows, curtains, sheets, a little tonic bottle and one thing is sure, he hasn't made a bags of it. 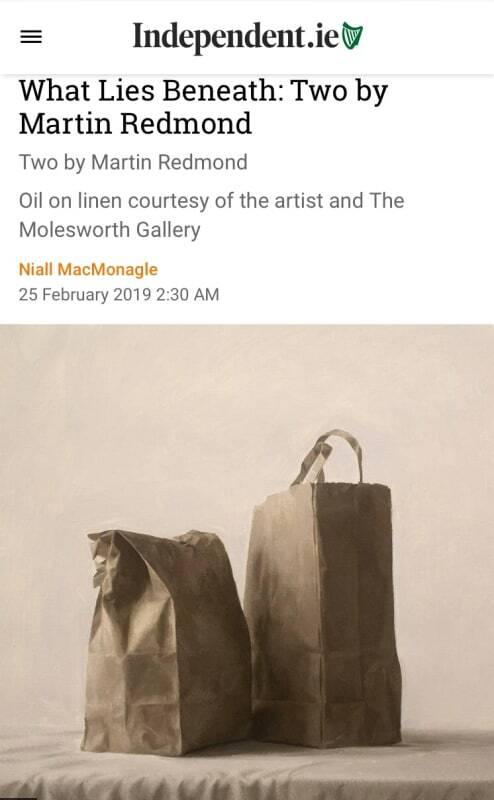 Recent Works by Martin Redmond, exhibition runs until March 1 at Dublin's Molesworth Gallery.